IBBI Assistant Manager Recruitment 2018 On Insolvency and Bankruptcy Board of India Recruitment invites to fill Officer Grade A (Assistant Manager) Vacancies in its IBBI department. For Fresher’s this is Latest Opportunities to fill before Last Night of 14 March 2018. Air India Experienced Utility Hand Recruitment 2018 on Fixed Term Employment basis to 8th pass jobs Named Experienced Utility Hand in AIESL Kolkata. 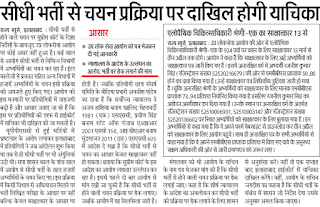 This news was partial modification of notification published on website www.airindia.in for recruitment of Utility Hand in AIESL. To know more updates of AIESL EUH Recruitment, Age Limit, Selection Process visit below linked article. SSC CHSL Result 2018 SSC department of Combined Higher Secondary Board declared the SSC CHSL Result of LDC, DEO Postal and Sorting Assistant by medium of merit List. 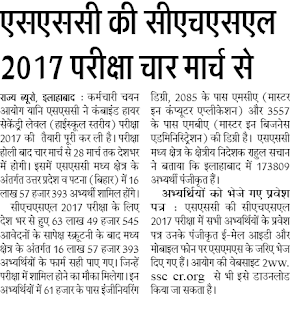 To check SSC CHSL LDC Merit List 2018 you may need to first download SSC CHSL Final Result 2018. UPPSC Medical Officer Interview Date 2018 Happy Holi Friends, Now Latest news is AMO (Allopathic Medical Officer Interview) Call Letter is scheduled from 13 March 2018. Interested Candidates who are selected may read below notification and should attend UPPSC Medical Officer Interview Before march 2018.